Mass was originally celebrated at Gidleigh Park… .which was a private house. Then in 1946 we moved to the British Legion Hall later known as St. Catherines House and then Endacott House…and then we were given notice because the building had changed hands and we went to the Jubilee Hall. The accommodation at the British Legion Hall was not vast because the large room already housed a billiard table and a table tennis table and the inner room only held a makeshift altar and about 16 chairs. 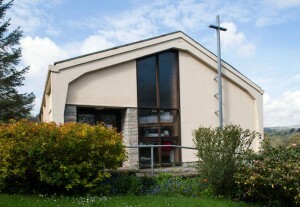 The overflow of parishioners had to hear Mass through the little window between the two rooms. Our priest was Father O’Leary. who was moved in 1950…to be followed by the first Fr, Michael Murphy. The Church opened in 1963. Father Michael Murphy who orchestrated the whole project was a very quiet and shy person, Sadly he was moved a year after the Church was opened. Many of our parishioners come quite a distance some from as far away as Winkleigh. There is a basic congregation of about 50. The Church is looked after by Dr. Rhodes and a highly efficient team of parishioners, who Minister, clean, read and do flowers. …and take Eucharistic services when the priest is unable to come.